We are at the touching point of La Boca, San Telmo and Puerto Madero neighbourhoods. We offer confortable and spacious rooms and a cool atmosphere. Ideal for students and backpackers. 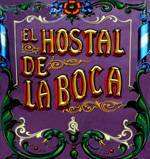 El Hosetl de La Boca ... No other comence except that it was well located. Hostal de la Bocas building is an old Hotel from the early XXth century fostering some of the immigrants that massively came to Buenos Aires at that time. This type of construction was denominated conventillo, shared by many families. Completely refurbished, the Hostel preserves its original characteristics: High ceilings, huge windows, a big porch, internal patios and the incessant feeling of being right at home. 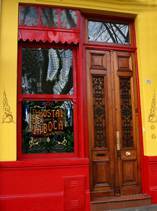 We are located in the Heart of Buenos Aires, between La Boca, San Telmo, Barracas and Puerto Madero neighbourhoods. We have an excellent location on Avenida Brown, close to more than 20 bus lines that allow confortable travel to any point of the city. At 5 minute walking distance is Plaza Dorrego, the heart of San Telmos historic neighbourhood, with its antiques fair every Sunday. In Puerto Madero you will find the best restaurants, movie theatres and bars. Traditional and picturesque Caminito and Boca Juniors Stadium are also at walking distance.